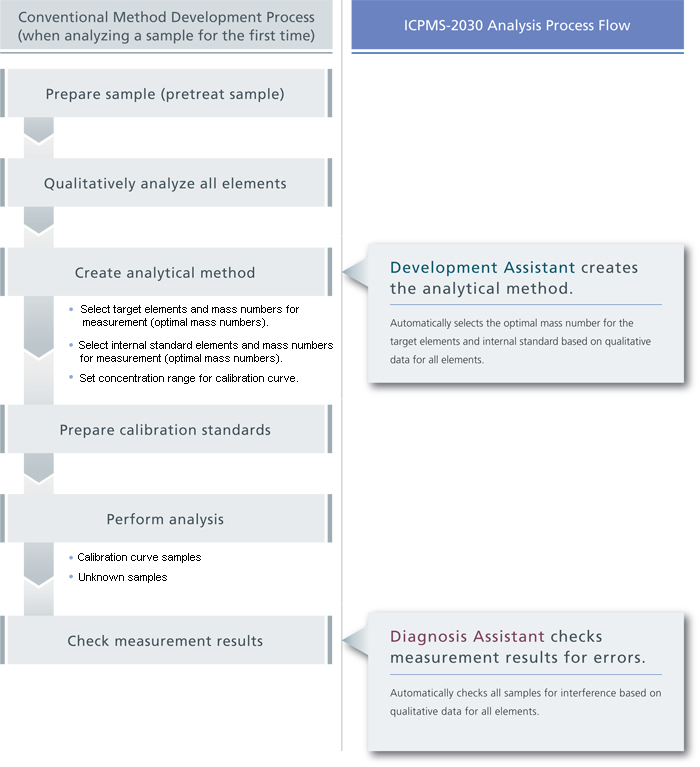 The Development Assistant simplifies the process of developing analytical methods. The Diagnosis Assistant automatically diagnoses spectral interference. Together, they provide analytical results with exceptionally high reliability. Development Assistant Function Ensures Analytical Methods Can Be Developed with Confidence by Anyone. Creating analytical methods for ICPMS analysis involves only selecting the measured and target elements, even for samples being analyzed for the first time. 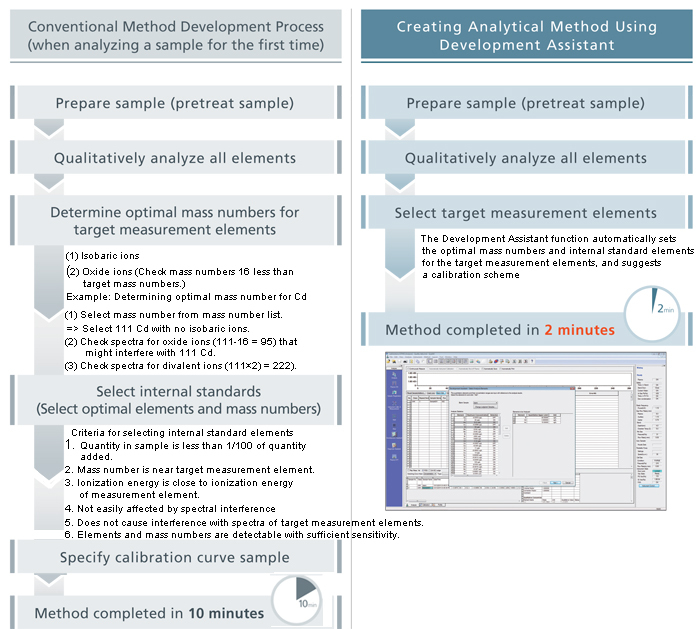 Then, based on the qualitative analysis data (for all mass numbers) from a representative sample, the Development Assistant automatically selects the optimal mass numbers and internal standard elements for the target measurement elements and automatically specifies the concentration range for calibration curve samples. 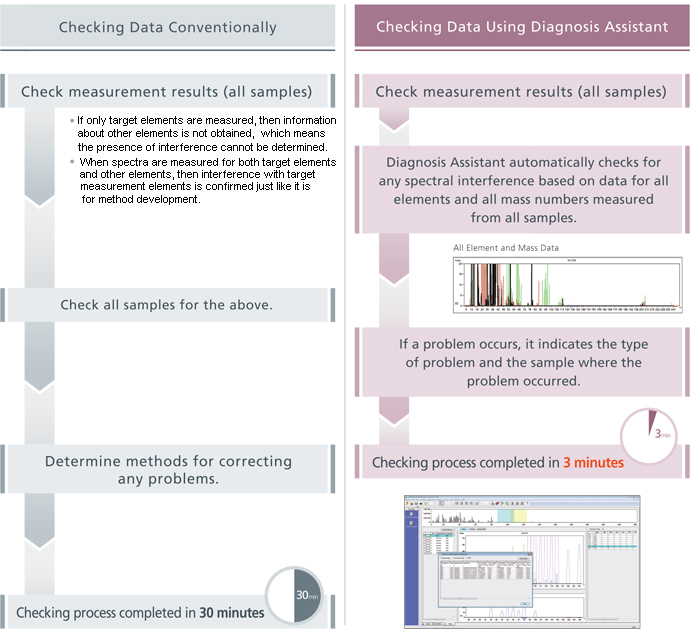 Obtain Reliable Results Quickly with the Diagnosis Assistant Function. The Diagnosis Assistant automatically diagnoses spectral interference, based on data measured from all mass numbers. Even when using an already established method for routine analysis, the software analyzes data for any spectral interference to determine if a problem occurred.